When it comes to total quality and reliability you need look no further than Delphi Borg & Beck. 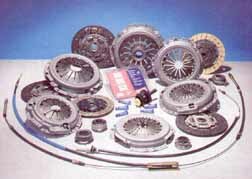 Delphi Borg & Beck is a clutch manufacturer offering a full and extensive range of clutches for all key British, European and Japanese vehicles. We have the stocks to prove it ! All replacement products are manufactured to meet the original equipment standards that are supplied by the company, as Original Equipment, to Nissan, Rover, Honda, Renault, Fiat, Ford, Volvo and Saab to name but just a few.